SYLLY: Shark Week Day 2 -- Real Shark Week! DETROIT, M.I. 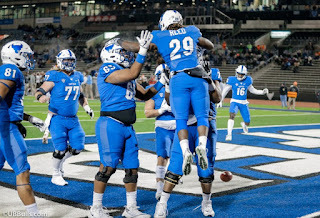 -- The University at Buffalo football team was picked to finished second in the Mid-American Conference's East Division in the MAC Media Preseason Poll released at MAC Football Media Day on Tuesday. In the poll, determined by the league's media members, the Bulls received 112 points, including one first-place vote. Ohio was the only school in the East Division with more votes, receiving 140. Buffalo returns 14 starters to a team that went 6-6 overall and 4-4 in conference play a season ago. The Bulls finished the season with three straight wins for the first time as an FBS program. The 2018 season kicks off on September 1 against Delaware State at UB Stadium.